The rankings for the top Pharmacy Colleges in India is published yearly by NIRF. These rankings are based on many parameters by including factors such as average salary of graduates, placement and higher education. Here, we have given details of the top 25 best Pharmacy Colleges in India, based on NIRF Rankings, 2017. National Institutional Ranking Framework (NIRF), under the Ministry of Human Resource Development (MHRD) provides rankings for the best Pharmacy Colleges in India. Every year, the top Pharmacy Colleges are selected from the list of participating institutions. This year, NIRF Rankings 2018 is expected to be published in April 2018. As per the NIRF Rankings 2017, details of the top 5 best Pharmacy Colleges are given below. 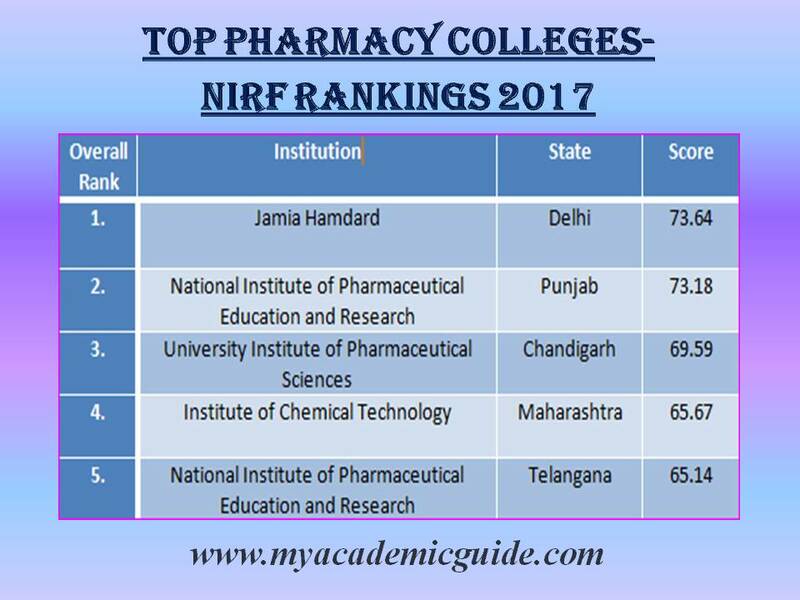 Jamia Hamdard, New Delhi, holds first rank in overall ranking for the top Pharmacy Colleges in India. Moreover, Jamia Hamdard, New Delhi was ranked first for Research and Professional Practice (RPC). This is based on the number of patents and publications among others. Median salary of placed graduates for Undergraduate (4 years) program was Rs. 375000. For Post Graduate (2 years) program, the median salary was Rs. 380000. National Institute of Pharmaceutical Education and Research, Mohali was ranked second best Pharmacy College in India. Median salary for PG (2 years) was Rs. 4 lakhs. University Institute of Pharmaceutical Sciences, Chandigarh was ranked #3 for overall ranking for the best Pharmacy Colleges in India. Additionally, this same institute ranked first in two ranking parameters. These two parameters are Graduation Outcomes (GO) and Outreach and Inclusivity (OI). Ranking #1 in GO means having best placement, average salary and higher studies. Also, University Institute of Pharmaceutical Sciences, Chandigarh came first in OI. This means being ranked better in inclusion of students, including economically, socially, or physically challenged candidates and those from other countries/ states. Additionally, median salary of placed graduates was 10.95 lakhs for UG (4 years). And, the same after PG (2 years) was 3.25 lakhs. According to NIRF Rankings 2017, Institute of Chemical Technology, Mumbai, reached rank #4 in top Pharmacy Colleges in India. Moreover, average salary of placed graduates after UG (4 years) was 3.5 lakhs. Also, the same after PG (2 years) was 5.05 lakhs. National Institute of Pharmaceutical Education and Research, Hyderabad was ranked as the fifth best Pharmacy College in India. Moreover, this institute has reached first rank for the parameter- Teaching, Learning and Resources (TLR). This means ranking first in factors such as faculty- student ratio, number of doctoral students and faculty with PhD. In addition to this, average salary of placed graduates for PG (2 years) was 5 lakhs. Read our great motivational message to all test takers: Together, In These Testing Times!- A Message To All Test Takers. NEET 2018 Application/ CBSE NEET Registration. CBSE has released the NEET 2018 notification on 8th February 2018. Candidates can start the NEET 2018 application process/ NEET 2018 registration now. And, for this candidates should know the NEET 2018 Application- date, website and required documents. In order to do the NEET registration properly, applicants should check these instructions for completing the application form online. NEET 2017 was conducted on 7th May 2017. This time, NEET 2018 Exam date is 6th May 2018. And, the NEET 2018 Notification regarding NEET 2018 Application process is released by CBSE, as of 8th February 2018. Aadhar number is needed to complete the online NEET-UG 2018 application form for all candidates who are Indian citizens. On the other hand, passport number is required for foreign Nationals, Persons of Indian Origin (PIO’s), and Oversees Citizen of India (OCI’s). Those candidates who have been issued Aadhar number recently may face some difficulty while filling up the online NEET application form. When trying to complete the NEET 2018 application by entering Aadhar number, such applicants may receive website notification that their Aadhar information is not matching. This could be because their Aadhar information has not been updated in the UIDAI server yet. CBSE has directed applicants facing such problem to enter their 17 digit Aadhar Enrolment Number instead of Aadhar Number. Additionally, such applicants are instructed to select Aadhar Enrolment Number instead of Aadhar Number, under “Selection Identification Type”. Check for further details. There was some confusion among candidates about the number of attempts they can make for NEET-UG. Recently, CBSE has clarified that whether the applicants has appeared for AIPMT/NEET in the previous years or not, NEET-UG 2017 will be considered as the first attempt. Starting year 2017, candidates can appear for maximum three attempts. Initially, for NEET 2017, there was an upper age limit, specified as 25 years for General category candidates. And, for applicants belonging to OBC/SC/ST categories, there was a relaxation of 5 years. However, based on the Supreme Court verdict, this upper age limit for NEET 2017 was removed. Similarly, no age cap is expected for NEET 2018 too. CBSE NEET-UG 2017 was conducted in 10 languages- Hindi, English, Bengali, Assamese, Kannada, Gujarati, Marathi, Oriya, Tamil, and Telugu. According to CBSE NEET 2017 instructions, applicants opting for NEET in a particular vernacular language were required to attend the exam in the respective States of chosen vernacular language. Find more details. Applicants have the option to pay the NEET 2018 registration fee by Net Banking/UPI, E-wallet, and by Credit or Debit card. However, applicants should make sure that they provide correct email ID and registered mobile number. If any, CBSE will need to communicate with the candidates. Such future communication will be done via the email ID and registered mobile number provided during the online NEET 2018 application. 1. Proof of application fee remittance. 2. Minimum three printouts of the confirmation page of online NEET application. 3. Copy of self System generated Self Declaration for applicants from Telangana, Andhra Pradesh, and Jammu & Kashmir, opting for 15% All India quota seats. 4. Minimum 5 copies of identical passport size photograph scanned and uploaded on the online NEET application. 5. Minimum 2 identical post card size photos same as the one scanned and uploaded on the online NEET application. 6. Once the admit card is available, keep it until all the admission formalities are completed. Once the NEET Application process is complete, candidates will be eager to download the NEET Admit Card/ NEET Hall Ticket 2018. Currently, the NEET Admit Card 2018/ NEET Hall Ticket is expected to be available to download in April, 2018. Also, note that the NEET Admit cards will be uploaded in the CBSE NEET official website only. For further details, please check NEET 2018 Admit Card/ Hall Ticket-Date, Website & Steps to Download. NEET Results 2018 and NEET Rank Card/ Score Card will be available to download online from the official CBSE NEET Website only. Also, the NEET UG 2018 results are expected to be declared in June, 2018. For further updates, please visit the CBSE NEET official website. Also, check our NEET JOKES! Explore fun ways to prepare for NEET! 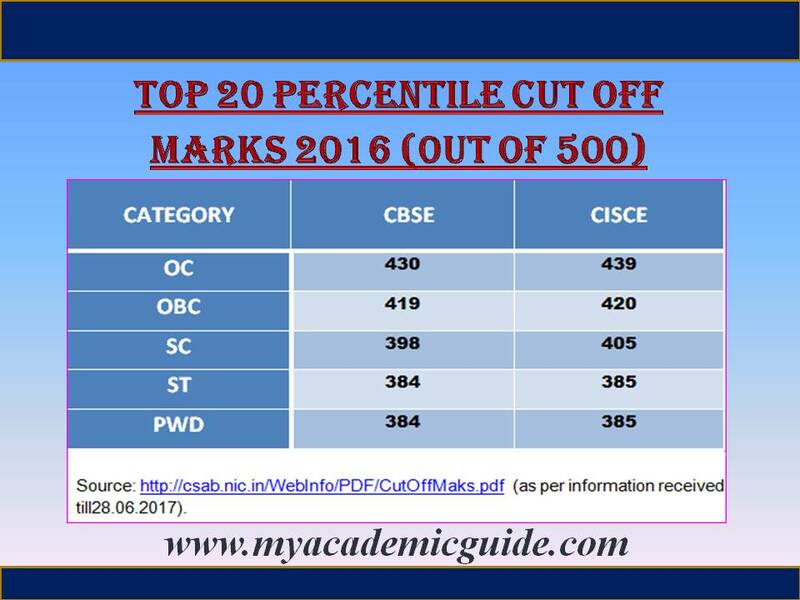 Furthermore, Check NEET Cut off Marks. Worried about NEET results? Read our great motivational message to all test takers: Together, In These Testing Times!- A Message To All Test Takers. Must Read! Whatever the results be, Stay focused & be motivated! Finally, do you know that your personality style will influence your learning style? 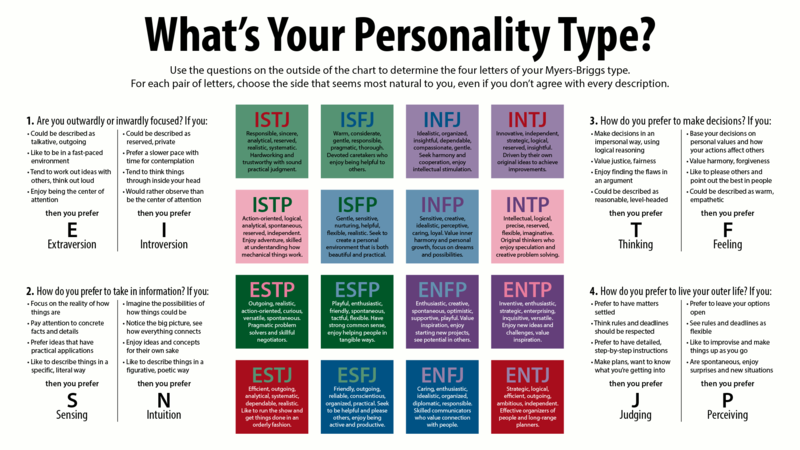 Now Take our Free MAG Personality Test in 2-3 minutes! How to calculate JEE Main Percentile of Class 12 Marks? Do you know how to calculate JEE Main Percentile of Class 12 Marks for 2019? Admission in IITs/NITs/IIITs and other CFTIs are based on the JEE (Advanced)/ JEE(Main) ranks. To qualify for admission, candidates should secure minimum 75% marks in the Class 12 Board exam. Or else, candidates should be in the top 20 percentile in the 12th class examination conducted by the respective Boards. Here you can check the steps to calculate the percentile. Also read important details about the JEE Main Percentile requirement, and additional considerations when calculating percentile. Weightage of class 12th marks is not taken while calculating JEE Main 2019 ranks. Therefore, percentile of Class 12 Marks is not checked when applying for JEE Main 2019. However, candidates have to show the mark sheet of class 12 during counseling for admission in IITs/NITs/IIITs and other CFTIs. Candidates should score at least 75% marks or be in the top 20 percentile in the 12th class examination conducted by the respective Boards. In order to qualify, SC/ST candidates should score 65% marks in class 12 exam. 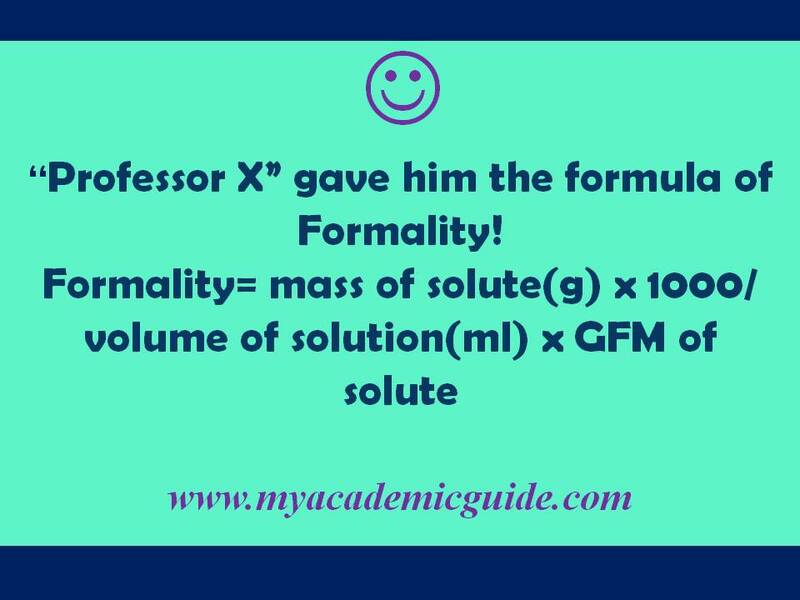 There are two ways for calculating percentile. These are percentile based on highest marks and percentile based on rank. This is similar to checking percentile based on rank. The method to calculate JEE Main percentile of Class 12 Marks for 2019 is given below. As we have seen in the above example, the candidate’s percentage of marks is 90%, while his percentile score is 98.33. This means, the candidate has scored 90% of the total marks for the Class 12 Exam. Also, 98.33% of candidates scored less than the candidate. 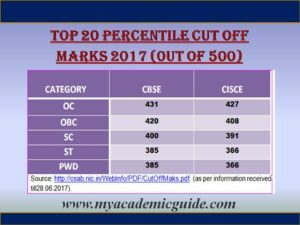 How to Calculate Percentile on the basis of highest marks? For exams like NEET, percentile is calculated on the basis of highest marks. Now, click here for more information about percentile calculation based on highest marks. Percentile and percentage are different. Percentage is the number that is expressed as a fraction of 100. To be eligible for admission on the basis of JEE Exam, candidates need at least 75% marks in the qualifying exam. Additionally, this percentage requirement for SC/ST candidates is 65%. JEE Main Percentile is calculated to compare marks among candidates. To be more specific, percentile is the number below which a certain percentage of scores or observations fall. For example, consider the candidate’s mark is calculated as 80 percentile. This means 80 percent of candidates scored below this candidate. This way calculating the percentile of Class 12 Board Exam marks will help to determine a candidate’s performance in comparison with others. In order to be eligible for admission in IITs/NITs/IIITs and other CFTIs, based on JEE score, candidates should be in the top 20 percentile in the 12th class examination. Please note, candidates belonging to different categories should be in the top 20 percentile for the respective categories. 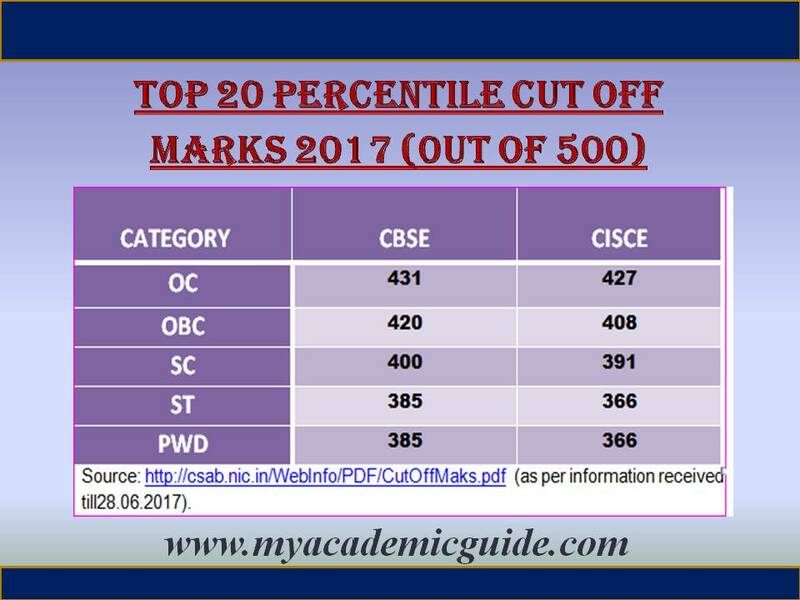 For calculating the category-wise cut-off marks for the top 20 percentile, the marks scored by all the “successful” candidates in their respective boards in the particular year is considered. Now, don’t forget to check the latest JEE News/ Notifications & Updates. JEE Main Admit Card/ Hall Ticket 2018 – date, website Link, and steps to download are given here. Candidates must bring the Admit card on the day of the Examination. Otherwise, candidates shall not be permitted to take the exam. Therefore, please take a few minutes to read these important instructions regarding downloading and checking JEE Main Hall ticket 2018. JEE Main Admit Card/ Hall Ticket 2018- when to download? The JEE Main Admit Card 2018 can be downloaded from JEE Main website, starting 2ndweek March 2018. Please check the official JEE main website for any changes or updates regarding the date to download JEE Main Hall Ticket 2018. Where to download JEE Main Admit Card/ Hall Ticket 2018? The candidates are required to download their JEE Main Admit Card 2018 from JEE Main website only at www.jeemain.nic.in. Many information websites provide updates about JEE Main to candidates. However, it is important that candidates download their JEE Main Hall Ticket from the official website only. How to download JEE Main Admit Card/ Hall Ticket 2018? *Firstly, go to the official JEE Main website at www.jeemain.nic.in. -The JEE Main Admit Card is issued provisionally to the candidate subject to his/her satisfying the eligibility conditions. -Candidates should check if all the information in the JEE Main Hall Ticket 2018 is correct. -Verify all information including Name, Gender, Birth Date, Paper, Test Centre, Name, City, State Code of Eligibility and Category are correct. -If any information in the Admit Card is found incorrect, contact JEE Main Secretariat/CBSE immediately. -Do not tamper with the JEE Main Hall Ticket or try to make any changes yourself. -Candidates are required to show, on demand, the Admit Card for admission in the examination room/hall. -Candidates who don’t bring the Admit Card on the Exam day shall not be permitted to attend the JEE Main examination. Candidates should check regularly for any updates in the official JEE Main website, www.jeemain.nic.in. For additional problems related to JEE Main 2018 application process, candidates may contact JEE Main help desk on working days from 9.00 AM to 5.30 PM. The JEE Main helpdesk phone numbers are available at www.jeemain.nic.in, under contact us section. However, for technical assistance, candidates can send email to jeemain@nic.in. 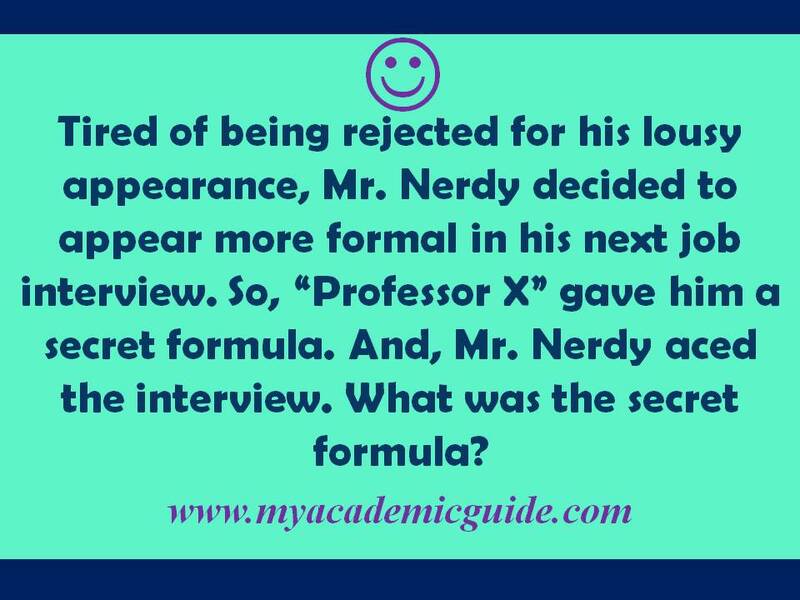 And for more, go to our JEE jokes section. 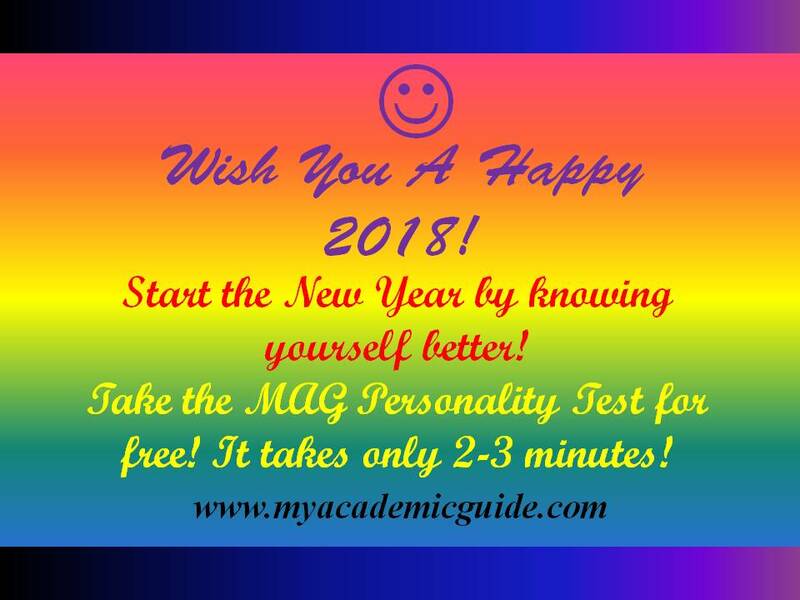 Visit us at http://www.myacademicguide.com/regularly to get important tips and updates about JEE Main 2018 and JEE Advanced 2018 Exams. Check for NEET/ JEE updates, Study tips, NEET/ JEE jokes, College rankings, Scholarship information to study in India & abroad and more! Also, check our video: Top 5 mistakes to avoid on Test day – NEET/ JEE/ AIIMS! JEE Main 2019 Application/ Registration: 10 Important Instructions! JEE Main 2019 Application process is expected to start around first week of December 2018. Candidates are requested to review the 10 important instructions given below prior to starting JEE Main 2019 registration. These instructions are intended to make the Application process easy and less stressful. 1. Be mindful of the dates! The official announcement about the JEE Main 2019 dates is not given yet. Once announced, candidates can start the JEE Main 2019 application/ registration process online during the registration period. However, candidates may get an idea about the approximate dates from previous years JEE Main application details. JEE Main 2018 Application process was done online from 1st December, 2017 to 1st January, 2018. However, candidates were able to pay the JEE Main 2018 application fee up to 2nd January 2018. JEE candidates are required to apply online only through the official website for JEE Main at www.jeemain.nic.in. 4. It’s as simple as five easy steps! *Class 12th certificates for candidates who passed class 12 examination in 2017 or 2018. *Scanned image of candidate’s photograph, signature and father’s/mother’s/guardian’s signature. According to the official JEE Main 2019 Information Bulletin, candidates may keep with them 6-8 identical photographs as used for the application. This may be needed during JEE entrance examination, Seat Allocation Process and Admission process. book their preferred slots, once the fee payment is done. If this is not done by the candidate, then the exam slot will be allotted automatically. Candidates are required to take printout of Acknowledgement Page or slip and keep it for future reference or further correspondence. This can be done once the JEE Main 2019 Application process is completed. Check the status of fee payment in the official website, at www.jeemain.nic.in. Once the payment is received successfully, then the status of fee payment shows ok in the website. Then the candidate will be able to print the acknowledgement slip. Candidates should check the JEE Main website regularly for updates. Additionally, candidates may receive official correspondence via SMS or e-mail. This may be send to the same mobile number or e-mail ID used during the application process. Therefore, candidates are required to check these regularly. For additional problems related to JEE Main 2019 application process, candidates may contact JEE Main help line. The JEE Main helpdesk phone numbers are available at www.jeemain.nic.in, under contact us section. JEE Main 2019 Application or Registration process should be done carefully after reading the important instructions. For this, candidates should dedicate enough time to read the instructions given in the JEE Main website, at www. jeemain.nic.in. Now, check for latest JEE Notification/ Updates/ News. 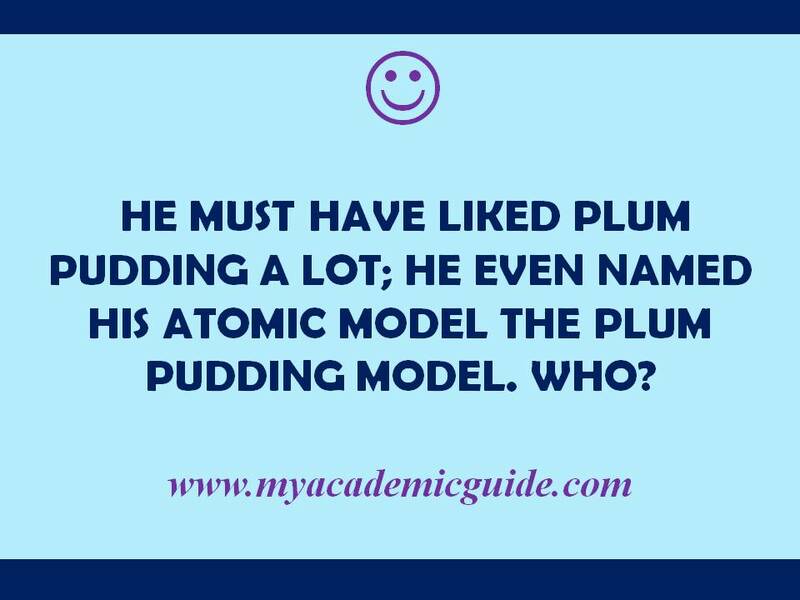 Visit us at http://www.myacademicguide.com/regularly to get important tips and updates about JEE Main 2019 and JEE Advanced 2019 Exams. 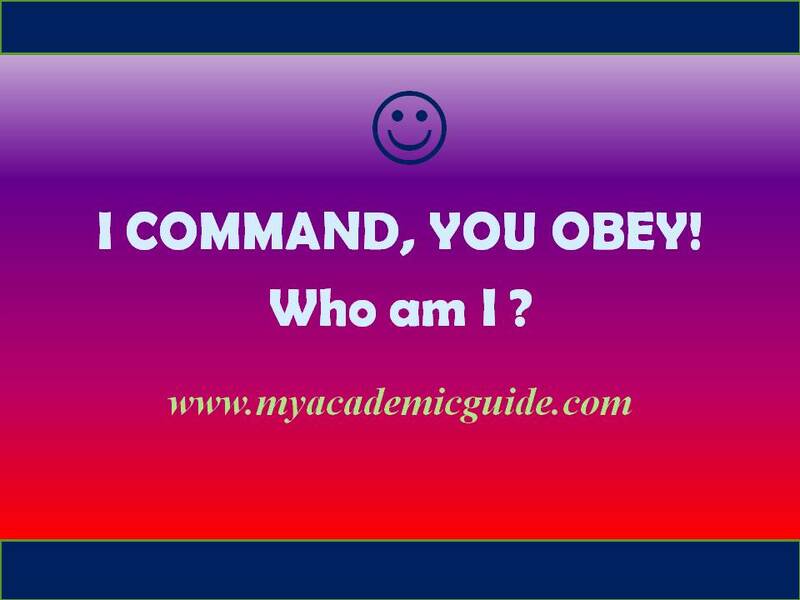 Visit www.myacademicguide.com for your academic needs! Check for latest JEE updates, Study tips, NEET/ JEE jokes, Top Engineering College rankings, Scholarship information to study in India & abroad and more! 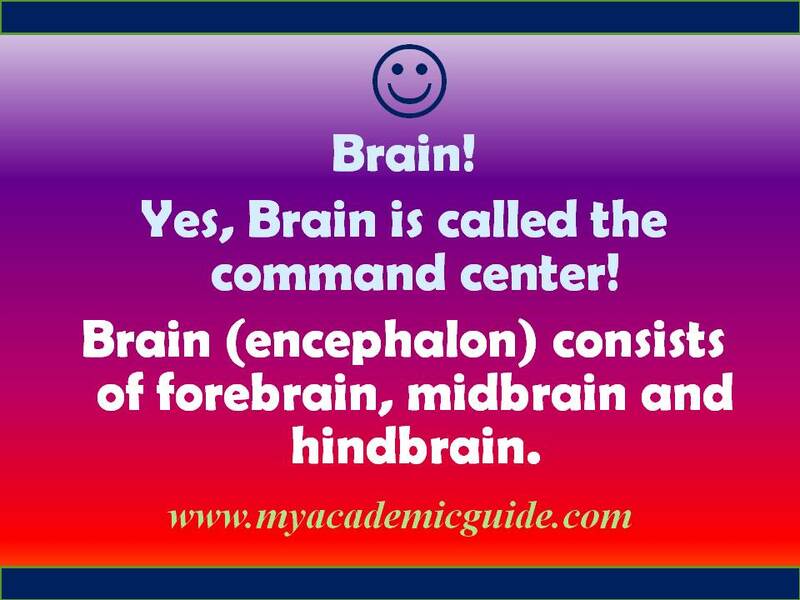 Share this post with your friends, parents, teachers, well wishers, and every other test taker you know! Share this on whatsapp, facebook, or twitter.